“Hybrid seeds might have reached millions of farms across the country but many villages still have desi seeds. Few crop varieties might have lost but still lots of desi seeds are available somewhere in the country. It is not destroyed completely thus we have to sincerely collect, preserve and use desi seeds in farming,” assures and advises Mr. Rajashekar R. Nimbargi. It is more than a decade he is working on collecting, multiplying and supplying desi seeds to other farmers. Nisarga Farm of Mr. Nimbargi is 21 acre farm 3kms away from Benakana halli, Vijapura district, Karnataka. “It belongs to me and my two brothers. As they both are working in cities I take care of the entire farm,” he adds. “Desi seeds are sturdy in nature thus resistant to diseases and pest attack. Due to this farmers need not spray pesticides on the crop and are able to produce poison free food for the buyers. Desi seeds definitely yields more than hybrid seeds and the food produced is packed with nutrients. It costs half the price than hybrid seeds. We are eating desi produce for past 12 years and since then we have not visited doctors for medication. 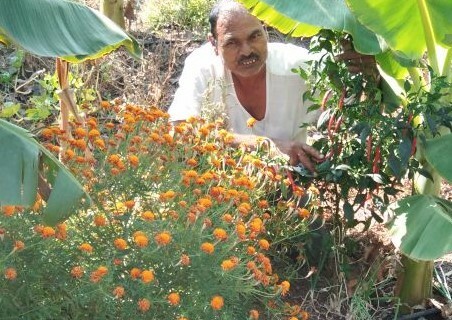 It is the power of ‘desi’ seeds and farming practices,” he highlights the unique features. Mr. Nimbargi develops seeds and also cultivates horticulture crops. 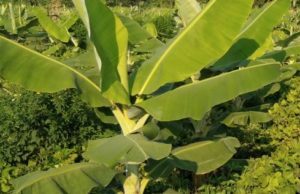 At his own farm he has mixed fruit orchard, 2 acres banana and 1 acre lemon. Vegetable are also cultivated but for seed purpose and personal consumption. 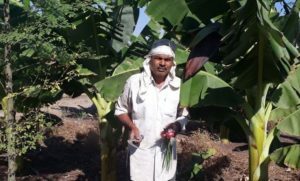 Few fruits grown at his farm are coconut, custard apple, sapota, papaya etc, vegetables seeds available are okra, radish, bottle gourd, cluster beans, rajagiri, cucumber, coriander, methi etc. Desi seeds of moringa and millets are also available with him. In 12 years his seed collection has 50 varieties of desi seeds of different crops. “Apart from it I have 10varieties of sorghum seeds (Halasgunde, Basamathigunda, uddmaandangi, halasjola etc) and 7varieties of paddy (navra, etc). Primarily it is the effort of my parents and now I am committed to carry on the legacy,” asserts Mr. Nimbargi. Seeds are stored in simple gunny bags with neat labeling. “I soak gunny bags in cow urine and dry it for 2 days. Then I mix powders of Calotropis Gigantea leaves, neem leaves and custard apple leaves with seeds. In case of dicot or monocot, I mix the seeds with ash. To prepare the ash, I burn cow dung cakes and sieved it to get fine powdered ash. Sometimes as required I make a paste of ash and apply it on the seeds. Millets are tough fiber so it is stored as it is. All these measures are taken to improve the shelf life of seeds,” he shares. 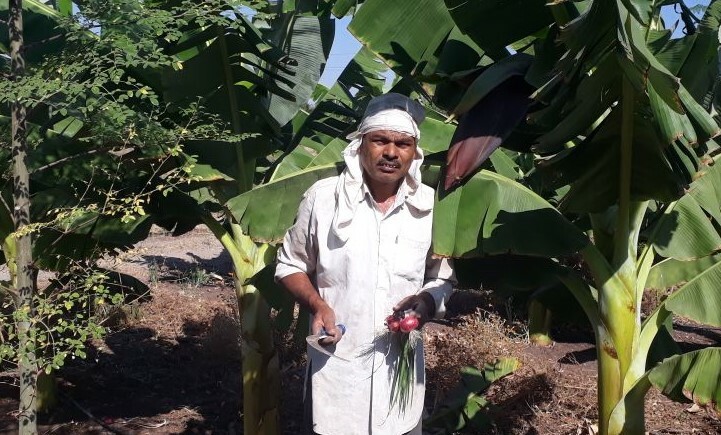 Mr. Nimbargi was practicing chemical farming for 29 years but now he switched to zero budget natural farming after attending Mr. Subhash Palekar’s seminar in 2006. “As per Mr. Palekar’s advice every farmer should grow everything and eat the same. He also insisted on using native seeds. The seminar moved me a lot and subsequently I immediately discontinued use of chemicals in the farm, started preserving and using desi seeds and began integrated farming from mono cropping. I strongly feel farmers must attend such seminars to learn new things,” he avers. Collecting, developing and supplying desi seeds is an add income for the farmers as per Mr. Nimbargi. “Desi seed is just one time purchase because from the next season farmers can save their own seeds for next sowing. They can even sell the surplus seeds to other farmers and earn some extra money. Moreover it shall help to reduce diseases that people suffer from quite often these days,” he explains.